Tanzania Safari Cars – We own and maintain our own 4×4 Safari land cruises that are highly maintained for the safety and comfort of our safari lovers. The Vehicles are well equipped with two spare tyres always so your game drives can not be interrupted by lack of a spare tyre in case of an unfortunate puncture on safari. 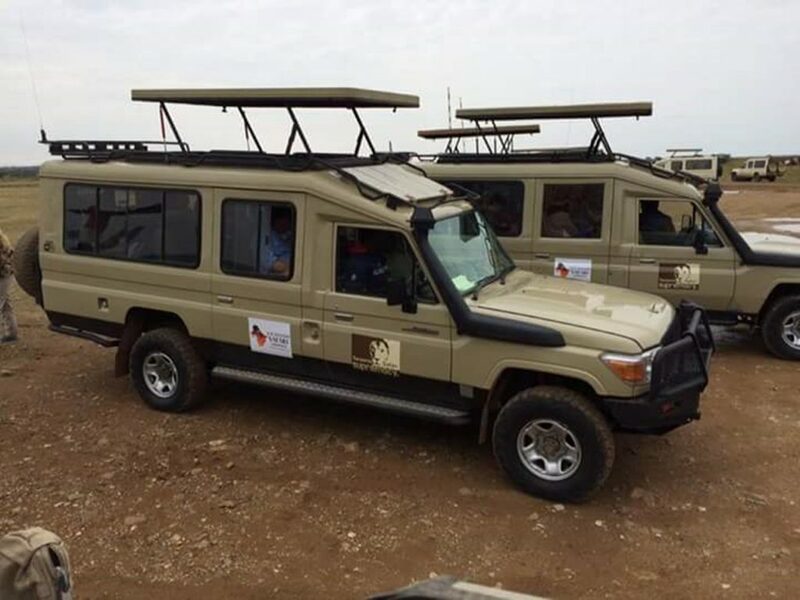 The cars are also fitted with HF and VHF radio systems and the drivers are always in contact in case of any need of assistance as well as communication in case a rare animal has been spotted. This helps maximize the chances of spotting of most the animals on safari including the big five. Regular safari vehicles can carry 4 with ample space and a guaranteed window seat for all. An extended vehicle can carry 6 persons very comfortably.